Hubby said this is the best thing I've ever made...in fact, he said it looks like something you'd buy at Dillard's (which is the most expensive place he knows of, so that was a major compliment)! I bought this stunning cherry blossom fabric on eBay a few years ago and loved it so much that I couldn't use it for anything. I finally got over that and this was the perfect project for it. 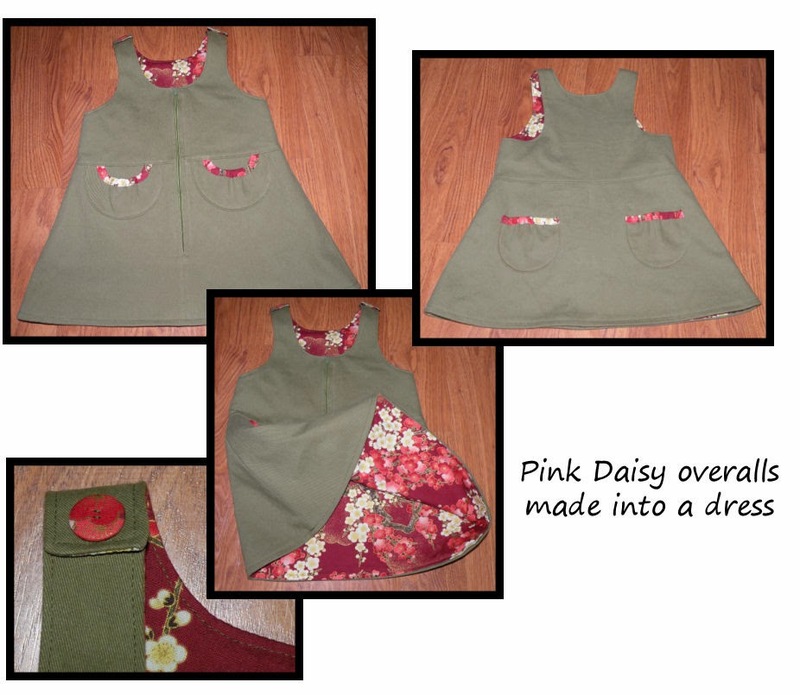 I used the "Pink Daisy" overalls pattern from Ottobre (3/2009 #8) for the dress, but modified the lower half to be a skirt, rather than pants. The main fabric is a nice heavy green twill I had left over from a baby carrier I made my cousin. It's fully lined with the cherry blossom quilting cotton...I had originally planned to line only the top half, but I'm glad I lined the whole thing. It makes for a nice, warm jumper for fall/winter/spring! I wasn't sure what to do for buttons, so I snagged some navy blue ones from my stash, covered them in fabric, et voila! matching buttons! (By the way, they are non-functioning...didn't think it was necessary with the long zipper and wide armholes). I prefer taking pictures in daylight, but hubby forbade me from putting it on her till he came home so he could see too. The close-up of the buttoned shoulder is most true to life. I wasn't sure if I'd like the back pockets on a dress as well as if it were actual overalls. I had some trouble with the binding on the pockets. You're instructed to gather the tops of the pockets (both front and back) to the length of the binding, but the binding is the same length as the ungathered width of the pockets! Once I got the binding on the pockets (I shortened them by about an inch each), they were still longer than the pocket placement marks, so I ran a piece of 1/8" elastic through the binding and pulled in the fullness that way. It turned out very nice, but next time I'll see if I can shorten the binding enough to make the elastic unnecessary. Did anyone else who has made this run into the same problem? Or did I do something strange when cutting out? My SWAP will be complete after just two more garments! BUT...I am definitely going to add some more leggings and some pinafore dresses for layering. I'll see what I can use from my stash. I am also thinking about another jacket for playing outside on chilly days. This is really awesome. The fabrics really make the outfit. The pockets are cute on both front and back. Good job! Wow, this outfit is so adorable. Beautiful work! What a beautiful outfit! I love the cherry blossom contrast on the jumper & the blouse really shows off the gorgeous fabric! Great job, I think I"ll have to try this pattern next! That blouse is adorable in the cherry blossom print. I just love these. I really wouldn't have thought of using the cherry blossom fabric in a child's blouse, but now I've seen it, I couldn't imagine it in anything else. Great job. Great job on this set. Beautiful cherry blossom fabric. The jumper and blouse are beautiful!!! Mind if I steal the idea of changing the overalls into a jumper??? Absolutely beautiful. I've never even heard of Dillard's but I totally agree with your husband. This set is amazing. 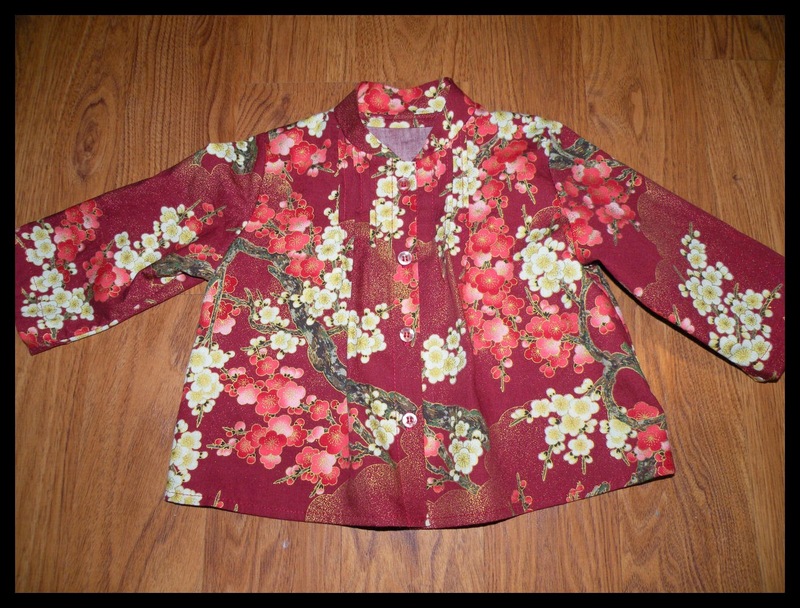 I love the cherry blossom print, and the outfit looks adorable on your daughter. I laughed when I read that your DH had banned you from putting it on her until he got home. I would love that my DH would care about something that much. Wonderful post. Very cute! Definitely looks like something from a high end store or boutique.